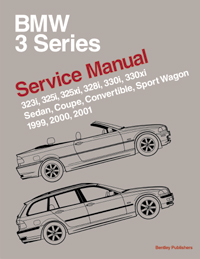 We have available most every manual in print for BMW, Porsche, and Mercedes Benz, along with microfische. Please email us with your wishes...we're happy to obtain the books you need! * Maintenance procedures for everything from brake fluid changes to interpreting the Check Engine indicator light. This manual tells you what to do and how and when to do it. * Engine and cylinder head service, repair and reconditioning, including camshaft timing chain setup and adjustment. * Information for specific driveability problems, including explanation of engine management systems and OBD II (On-Board Diagnostics II). * Theory of operation and repair information for the resonance/turbulence intake system, VANOS (Variable Camshaft Timing) and Dynamic Stability Control (DSC). * Drivetrain maintenance, troubleshooting, adjustment and repair, including hydraulic clutch, gearshift linkage, driveshaft and all wheel drive system. * Heating and air conditioning repair, including A/C component replacement. * Body adjustments and repairs, including convertible top and tailgate replacement and adjustment. * Wiring schematics for all circuits, including power distribution, grounds, and component location illustrations and photos. Features Engine Service , Repair and Reconditioning. Including valve adjustment (M30 engine) and camshaft timing chain set up for the V8 & V12 engines Information on specific driveability problems for DME 1.2 (Early & Late) DME 1.3,1.7 &3.3 engine management systems. On Board Diagnostics and Electronic throttle control. This shop manual is now avalable to our customers at $17.50 a copy. This is a long-awaited book, since there is no other that covers the E-36 cars as well. The manual is based on a complete teardown and rebuild, a normal Haynes procedure. Great books to work on your car. All manuals that Hayes make we can get, within a day or two. Write us and we will see if one is availanle for your car. The BMW 3 Series (E36 ) . We have them in stock and ready to send out. The manual covers 1992-98 318, 313, 325. 328 & M3. A very comprehensive manual for repairs and service. You will appreciate the quality of the photos, illustrations and the straight foward way in which they tell you about the workings of the car. Complete from front to rear with over 750 pages of information and more then 950 pictures and illustrations. Soft cover 8.5" X 11".A very complete manual . Weighs almost 5 lbs. These must-have books cover engine management systems, Bosch L-Jetronic, Motronic (325e, s), Motronic 1.1 (325i, is, ic), wiring schematics, rebuilding and technical tips, hard-to-find information, and much more. Large and complete. This book, weighing on at almost 3 1/2 pounds, is packed with 672 pages and 926 photos, illustrations and diagrams providing the highest level of clarity and completeness for all service and repair procedures. If you're looking for a better understanding of your BMW, look no further than Bentley. This new Bentley manual is the only comprehensive, single source of service information and specifications available for the Z3 roadster. The do-it-yourself BMW owner will find this manual , indispensable as a detailed source of repair information - any owner will benefit from reading and referring to it when planning maintenance and repairs. · Covers both 4 cylinder M44 and 6 cylinder M52 engines, including dual camshaft timing chain setup and adjustment, including VANOS variable valve timing on 6 cyl cars. · Information on specific driveability problems, and explanation of OBDII (On-Board Diagnostics II) and engine management systems. · Heating, AC component replacement, body adjustments and repair, transmission main tenance, driveline details, and complete wiring diagrams including component location. · Comprehensive BMW factory tolerances, wear limits, adjustments, and torques listed, along with many helpful illustrations and instructions. All the detail and quality information you expect from Bentley. Softcover, 8 3/8 in. by 11 in.